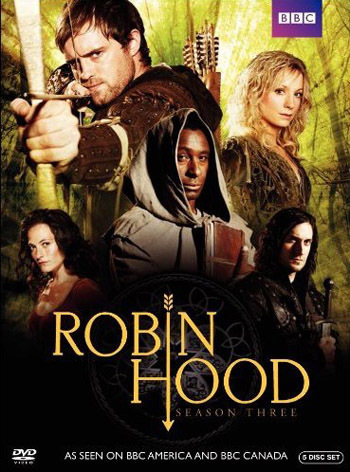 The legend continues... With new allies and old enemies, Robin Hood returns for a third series full of thrilling adventures as Robin and his gang continue to outwit the dastardly Sheriff and his forces. As the series begins, the outlaws are in disarray. Marian is dead and Robin has split up the gang and launched a solo mission to avenge her and kill Gisborne. It is only the intervention of the mysterious Tuck that stops Robin joining Marian in an early grave. Which is bad news for Gisbourne and the Sheriff. Under pressure from Prince John, they must take down Robin Hood once and for all. When the prince, tired of their ineffectualness and bad leadership, arrives in Nottingham to reprimand the Sheriff and Gisbourne, it becomes clear that there is only room forone sidekick at his table, but which one?